The Gemara asks in Tractate Shabbos, “What is Hanukkah?” As Rashi explains, the Gemara is inquiring as to what miracle brought about the establishment of the festival of Hanukkah. This raises an obvious question. 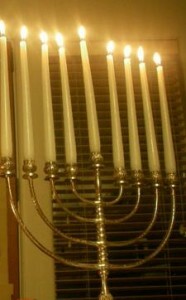 The paramount miracle of Hanukkah was that the Jews were victorious in battle over the Hellenic forces: that G-d delivered “the mighty into the hands of the weak, the many into the hands of the few.” Why, then, was Hanukkah established not for this preeminent miracle, but for the miracle of the cruse of oil? How did the subordinate miracle metamorphose into the consummate and primary miracle? But why does the Gemara give such scant and passing mention to the actual victory in battle and moreover, make no mention at all about its miraculous nature? Granted, the main aspect of Hanukkah is the spiritual victory and miracle, but there was a truly miraculous physical victory as well. Moreover, the spiritual triumph came only through the physical triumph. Shouldn’t the Gemara have mentioned – at least in a subordinate manner – the miracle of the victory in battle? It was not the Torah per se that the Hellenic regime wished to uproot from the Jewish people, but “Your Torah” – i.e., that Torah is of Divine origin and as such transcends human intellect. Nor were they against the Jews’ practice of the Torah’s mitzvos as a moral and ethical code. It was specifically the “the decrees of Your will” – the suprarational commands that defy all logic and reason and are performed only out of acceptance of the Divine yoke – that they wished to outlaw. That is to say, the war waged by the Hellenists was against the Jewish notion that G-dliness utterly transcends all aspects and elements of creation and nature, and as such cannot be grasped with human intellect. We can now understand why, when the Gemara asks as to what miracle brought about the Hanukkah holiday, it only mentions the miracle of the oil and makes no mention of the victory in battle. For when speaking of the essence of Hanukkah – “What is Hanukkah?” – it is solely the miracle of the Hanukkah lights that symbolize the spiritual illumination – “A mitzvah is a candle” – that resulted from the spiritual victory. And although the military miracles anteceded and made possible the lighting of the menorah in the Holy Temple, the spiritual aspect and content of this festival so predominates that it completely eclipses its physical aspect of victory in battle. This is to the extent that the physical aspect is completely ignored when we speak of the miracle that defines the essence of Hanukkah. Hanukkah, with its spiritual dimension entirely overshadowing its physical dimension, empowers us to attain a level of spirituality where the supremacy of the soul over the body is so absolute that the body is virtually invisible – the body’s needs become of no particular import. For although the soul is vested within the body, and the soul in this world can only serve G-d through the medium of the body, nevertheless the bodily needs are completely eclipsed by his spiritual being and essence. So that when one looks at the “Hanukkah” individual, one sees not a material creature, but a spiritual one; the entire physical dimension of the person serves but as a vehicle to the successful fulfillment of the spiritual service of the soul.